Like most Australians, on Monday morning before work, I tuned in to the women’s final of the US Tennis Open. For the first time in my lifetime, an Australian woman was in with a real shot of winning a tennis Grand Slam. Going up against the most dominant female sportstar of the past 20 years, Serena Williams, I’d written Samantha Stosur off as a pretender. Williams’ evisceration of world number one, Caroline Wozniaki, just a day earlier, had cemented in my mind that, despite what the rankings suggested, Williams was still the best player on the planet. Rather than going down in a blaze of flames, Stosur was going out on a blaze of glory (thank you Bon Jovi). Enduring another Williams sister temper tantrum, Stosur played the match of her life. And, before you could say “In your face, Malloch!” Stosur won in straight sets. In fact, the match was essentially over in the blink of an eye, lasting a mere 1 hour and 13 minutes. So, while it was a great triumph for Australia (and, er, Stosur…) it was all over a little fast. Obviously this is because women only play the best of three sets. When tennis began, all those years ago, men played best of five sets and women played best of three because, apparently, women were less physically able than men. Let’s fast forward to 2011. 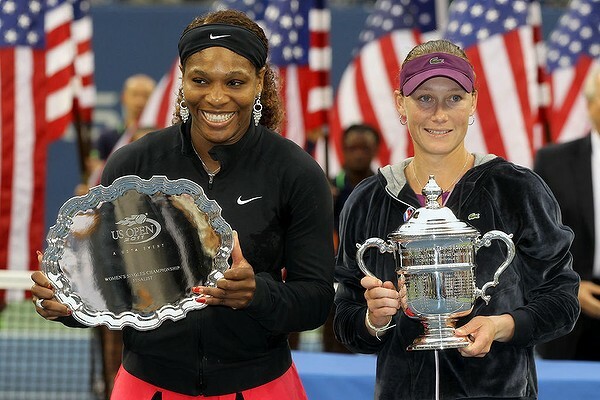 Women tennis players earn the same amount of prize money as men – totally fair. Women do the same amount of training as men throughout the year – totally understandable. Women command the same amount in sponsorship revenue – completely fair. However, women play 60% of the amount of match time men do – huh?? Surely this is what the world’s feminists should be up in arms about: the outdated and stupid notion that women’s bodies aren’t up to the rigors demanded of them to play for a best of five sets. Look at it this way; in every tournament outside the Masters and Grand Slams both men and women play the best of three sets. Yet when it hits the big time, men switch to best of five. Meanwhile, in other sports, women all over the world continue to excel in grueling sports which make tennis look like a walk in the park. For example, three times World Ironman champion, Chrissie Wellington (UK), doesn't do 60% of the distance male Ironmen do. And then there's Shelley Taylor-Smith, an Australian ultra marathon swimmer. In fact, she was the best distance swimmer in the world, men or women, for a while. Women continually demonstrate the capacity to perform at a high level despite the physical burdens. So, can anybody out there please explain why women don’t play best of five sets tennis? Because I’m drawing a blank. Heck, even if only the finals of Grand Slams were best of five sets it would be enough for me (similar to men’s doubles or the Olympics). From a financial perspective it makes sense. Serena Williams or Maria Sharapova would be on court for an average of 40-60 minutes longer each match providing her sponsors with even more air time. Matches would last longer meaning on-site food and drinks sales would increase. TV broadcasts would go longer meaning more advertising revenue. And all it would cost is people realising women probably could, without too much of an issue, play a best of five sets match. So come on girls. Stand up for your sister suffragettes and campaign for their equal rights on a tennis court. Women tennis players earn the same prize money as men because of politics not economics. Men are the major drawcards for specators and TV. Hey Dylan - good points, well made. I just noticed this though: For example, three times World Ironman champion, Chrissie Wellington (UK) and wondered if you meant IronWoman! I wonder if you'll get some reaction anyway.